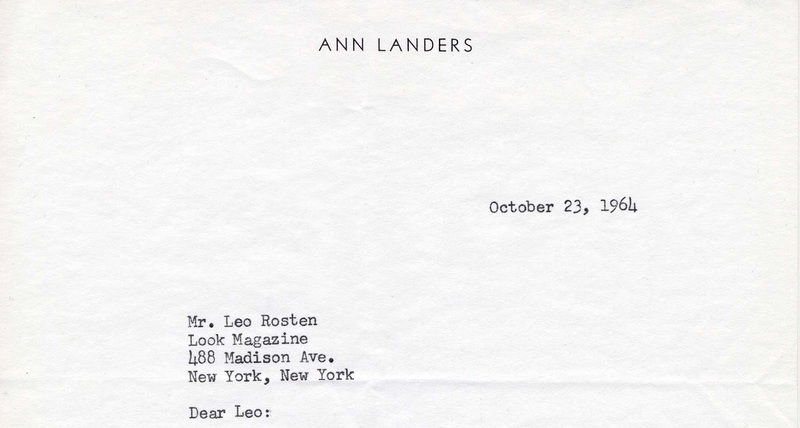 The Brandeis University Archives & Special Collections Department is proud to count among its holdings the Leo Rosten papers. 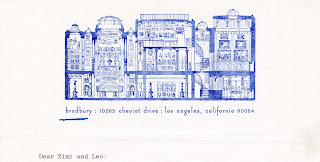 In 1908, the man who would become known professionally as Leo Calvin Rosten was born in Łódź, Poland. 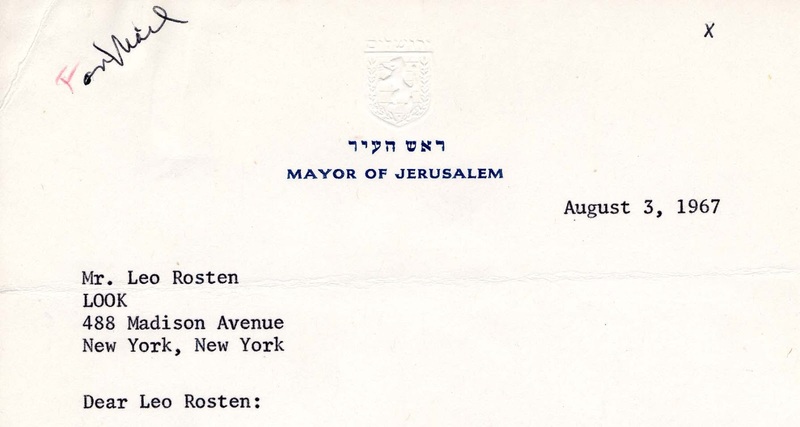 Having moved to the U.S. with his parents in 1911, Rosten was raised in Chicago. He earned his BA and PhD in Political Science from the University of Chicago before going on to conduct postgraduate work at the London School of Economics. 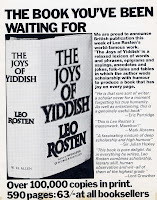 While best known as a humorist and for The Education of H*Y*M*A*N K*A*P*L*A*N (1937) and The Joys of Yiddish (1968), Rosten’s work and writing both crossed a number of genres. A scholar, novelist, lexicographer, scriptwriter, journalist, playwright, biographer, and essayist, he was a hugely prolific public intellectual. 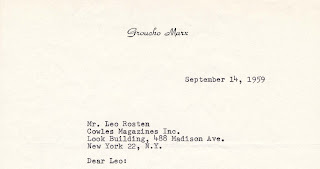 Many of his pieces for Look Magazine dealt with major contemporary political and social issues, and he is generally considered to have brought an understanding of Yiddish and its reflection of Jewish culture to American consciousness. 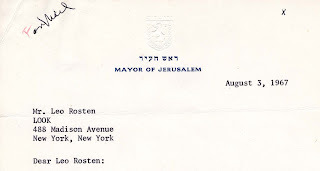 In Rosten’s New York Times obituary of 1997, The Joys of Yiddish was described as “the de facto standard reference work on the language, serving as a bridge between the world of Mr. Rosten's forebears and that of the more assimilated readers of our own age.”(1) That his writing was widely read and influential is evident from the myriad of fan letters he received, particularly those from many of the most famous political, literary, and artistic names of the period, including Allan Bloom, Ray Bradbury, William F. Buckley, Jr., Norman Cousins, John Kenneth Galbraith, Cary Grant, J. Edgar Hoover, Henry Kissinger, Groucho Marx, Bill Moyers, Richard Nixon, Gregory Peck, Arthur Schlesinger, Jr., and Thornton Wilder. In addition to his literary accomplishments, Rosten’s long career included a variety of professional experiences, many of which informed his writing. 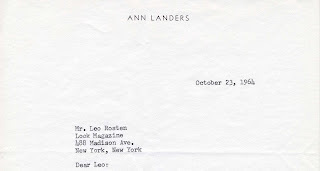 First published in The New Yorker under the name Leonard Q. Ross, the Hyman Kaplan stories were inspired by the people Rosten had met while teaching English to speakers of other languages during the Depression. 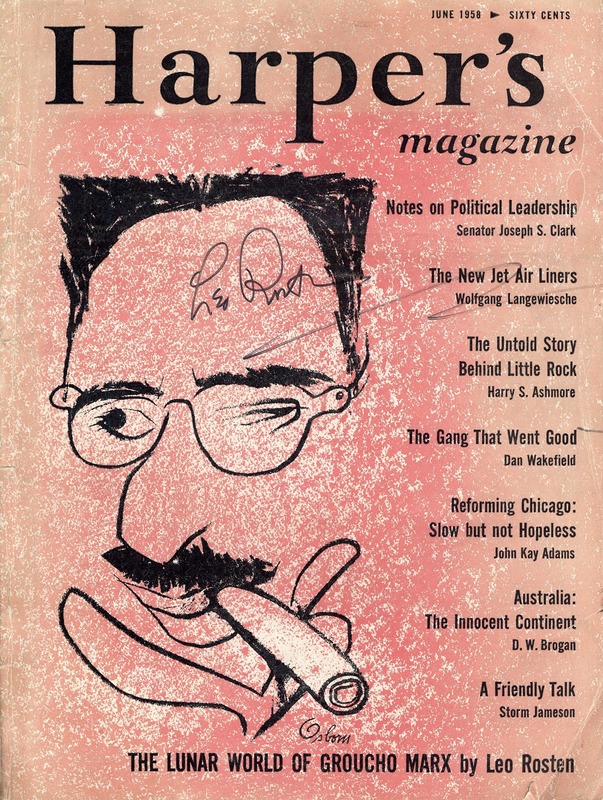 He also served at the Office of War Information during World War II, worked for the Rand Corporation, edited Look Magazine (from 1949-1971), and taught political science at a number of prestigious universities. Created and donated by Rosten himself, the collection at Brandeis comprises a meticulous catalogue of his long and fascinating career. It includes seventy-five boxes of note cards of research material, draft and final manuscripts, typescripts, galleys and printers’ copies, texts of numerous interviews and speeches, tapes of his readings, various publicity materials, correspondence, book reviews and other newsclippings, fan mail, dictionaries, reference books, and files from his time at the Office of War Information. 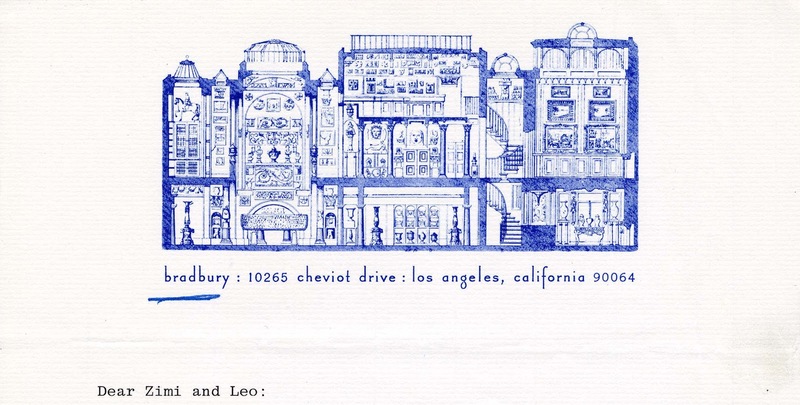 Items such as his academic hood, writing utensils, passport, and appointment books grant us a more intimate view into Leo Rosten’s personal life. 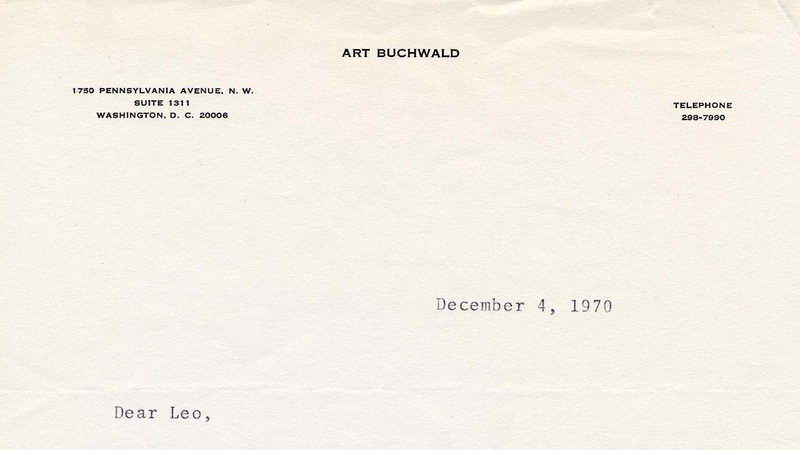 The Archives & Special Collections Department at Brandeis also boasts stewardship of an annotated typescript of “Mr. 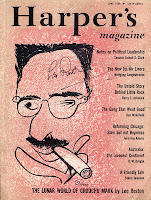 Kaplans Hobo,” a Rosten short story published in The New Yorker. 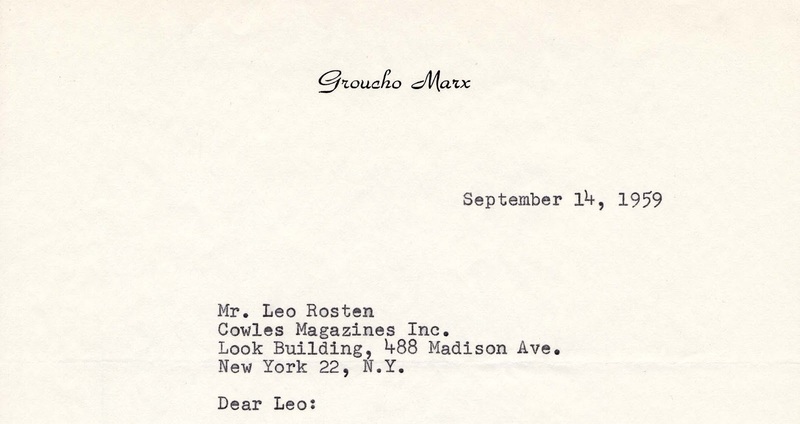 While not technically part of the Leo Rosten papers, as it was recently donated to Brandeis by an unconnected donor, this item, signed by the author, with editor’s notes, continues the work of the main collection in providing significant and rare insight into the thinking and methods of this extraordinary man and the era in which he lived. (1) Fox, Margalit. 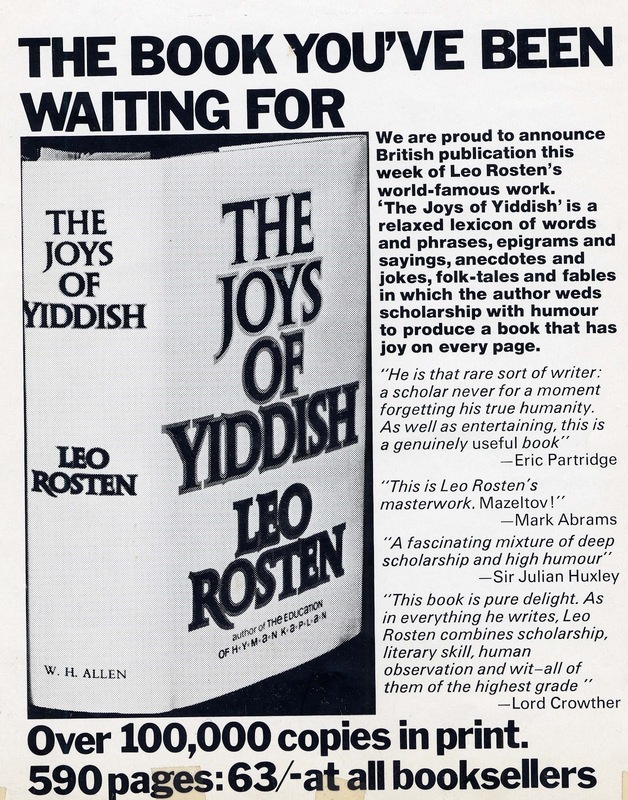 “Leo Rosten, a Writer Who Helped Yiddish Make Its Way Into English, Is Dead at 88,” The New York Times, February 20, 1997.